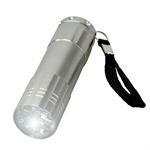 Home > Commercial-Land Mobile-Marine > Flashlite Batteries > CREE LED Tactical flashlight - 220 Lumens, includes battery. 4 modes ! 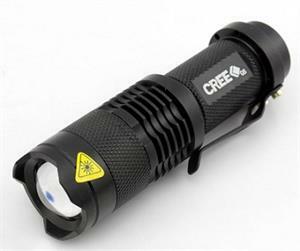 CREE LED Tactical flashlight light - 220 Lumens, includes battery (1.5v AA alkaline). Runs on 1 x AA size cell. 4 modes ! - Bright, Low, Strobe, Focusing beam. Premium quality, all-metal construction, with sturdy belt/pocket clasp. Size: 3.5" long, 1" diameter (92mm x 25mm). 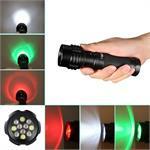 Can use with 1 Alkaline cell (220 lumens), or 1 Lithium 14500 cell for more power (350+ lumens). Push button on back of light to turn on. Please call us at 1-800-308-4805 for fleet pricing (25 pcs or more).